I recently gave a short talk about Dürer’s engraving Melencolia I (1514) in Rochelle Tobias’s seminar in the German dept at Hopkins. To begin I talked a little about the magic square of numbers. First of all it’s “normal”: each number 1,…,16 appears once. And not only do the rows, columns and two diagonals sum to 34, so do the 4 corners, the 4 numbers in the center, and the remaining parallel segments. The bottom row serves as Dürer’s second signature: the middle two numbers form the year the engraving was made and the outer numbers correspond to Dürer’s initials A=1, D=4. It’s believed that the sum 34 refers to Dürer’s age when he engraved it, 43, reinforced by the square’s placement beside the hourglass. There was a popular magical/astrological association at the time between magic squares and planets. Saturn corresponded to 3×3 magic squares and Jupiter to 4×4. 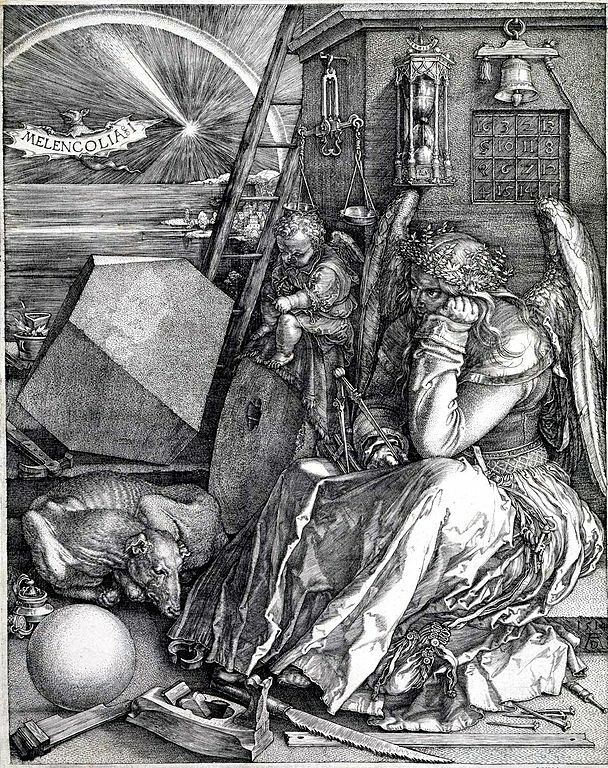 Rochelle pointed out that it makes sense for Dürer to have used a 4×4 rather than a 3×3 (Saturn is closely associated with melancholy) since things associated with Jupiter were supposed to help fend off melancholy. The solid in the engraving is rather mysterious and was the main subject of my talk. People have been debating it for at least the last 100 years with a possible breakthrough in 2004. The most influential work on the engraving—Raymond Klibansky’s magnum opus Saturn and Melancholy (1964)—has the least to say about the solid of all the objects in the engraving. The solid is completely unique to the engraving and doesn’t appear anywhere else in art or mathematics. At first it was thought to simply be a cube with two edges “truncated”, that is chopped off, leaving behind triangular faces. It doesn’t quite look like a cube but it was thought that Dürer simply made a mistake with perspective. Eventually it was agreed that Dürer wasn’t the sort to make mistakes with perspective and hence that the underlying shape must not be a cube. There have been quite a few papers over the years correcting for perspective in various ways to compute what the angles of the solid are, reaching different conclusions. 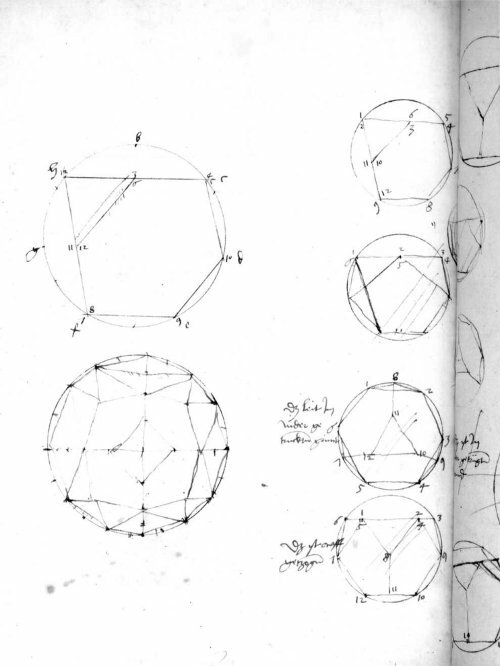 Rediscovering the Archimedean Polyhedra: Piero della Francesca, Luca Pacioli, Leonardo da Vinci, Albrecht Dürer, Daniele Barbaro, and Johannes Kepler, Archive for History of Exact Sciences, Vol. 50, No. 3/4 (September 1997), pp. 241-289. I probably found that paper the most interesting of the lot. It’s on the history of Archimedean solids. The simplest solids of all are the Platonic solids, solids like the cube whose faces are all the same shape and size. The ancient Greeks showed that there are just 5 of them—the tetrahedron, the hexahedron (=cube), the octahedron, the dodecahedron, and the icosahedron—and they used them as the basis for theories about the physical universe. 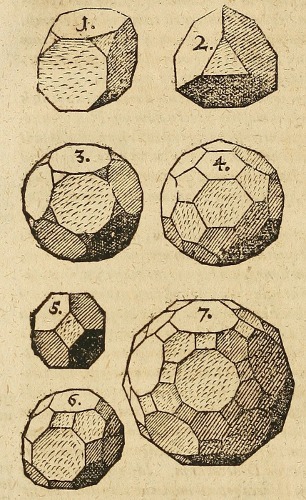 The next simplest solids are the Archimedean solids, solids whose vertices are all “the same” but whose faces are not. The ancient Greeks determined that there are just 13 of them (or 15 depending on how you count—2 of the 13 differ from their mirror images). One of the last great ancient Greek mathematicians Pappus listed all 13 of them, credited their discovery to Archimedes, but instead of drawing them cryptically wrote the total number of triangles, squares, pentagons,… each had. His work was correct but apparently forgotten—for more than a thousand years—until in 1619 Johannes Kepler published a complete list including drawings of each (reproduced above). 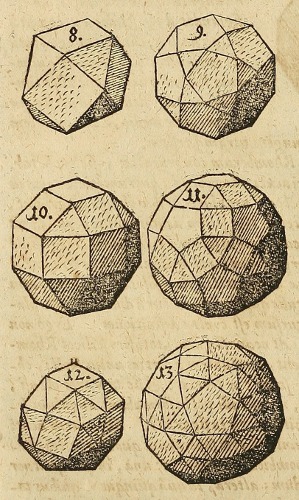 The table suggests that Dürer discovered two Archimedean solids previously unknown to Renaissance artists, the truncated cuboctahedron (6) and the snub cube (12). Dürer worked in two different ways: By drawing projections onto the three coordinate planes and by making what he called a Netz—lines on paper you can cut and fold along to make a model of a solid. Dürer appears to have invented this method actually, and he used it to discover new solids. Field thinks Dürer may have been aware of all 13 solids since one can construct a Netz for each of the missing solids by small modifications to the new Netze Dürer discovered, but that Dürer didn’t write them all down because Dürer didn’t realize there are only 13 of them. Field speculates that Kepler may have learned all this from Dürer and synthesized it with the work of Pappus. A further hypothesis on the polyhedron of A. Dürer’s engraving Melencolia I, Historia Mathematica, Vol. 31, Issue 1, Feb 2004, pp. 11–14. Weitzel argues that Dürer was on that page trying to construct a new Archimedean solid which doesn’t exist (one where each vertex touches one triangle and two pentagons) and that the pentagon Dürer in the process drew exactly matches the face of the solid in the engraving. In fact Weitzel finds that the angles of the sketched pentagon agree with the corrected angles computed by others for the mystery solid. So Weitzel argues that the solid in the engraving is the result of a failed attempt by Dürer to discover a new Archimedean solid. 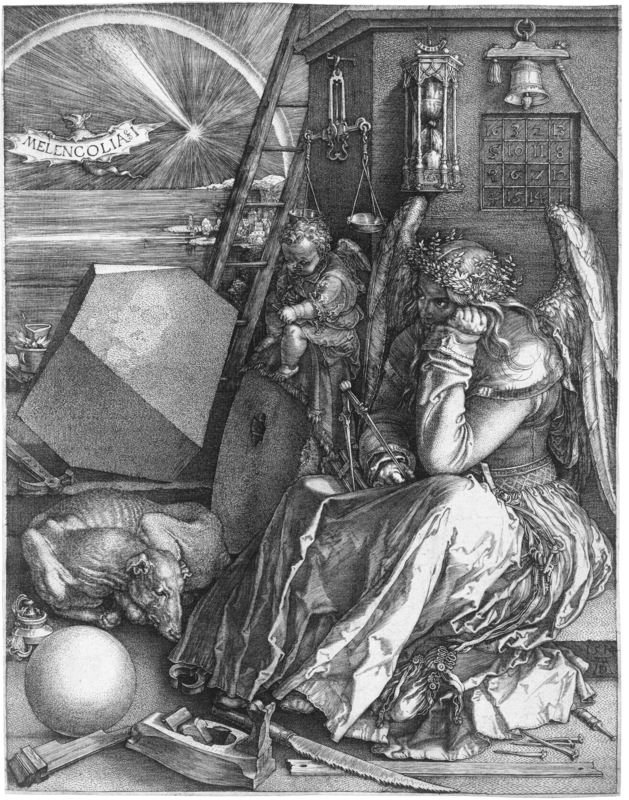 This seems consistent with Erwin Panofsky’s interpretation of the engraving as a spiritual self-portrait of Dürer, exploring the relationship between creative genius and melancholy. That’s the thrust of it as I understand it anyway. It’s kind of intense. That’s not even getting into black bile, the four temperaments, and the rest of it. 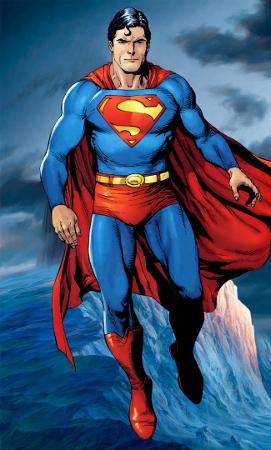 Saturn and Krypton—Superman as Winged Melancholia? A week or so after my talk it suddenly struck me that Dürer’s pentagon is quite similar to the outline of Superman’s “S” shield. This points to remarkable parallels between Melencolia I and the Superman universe. 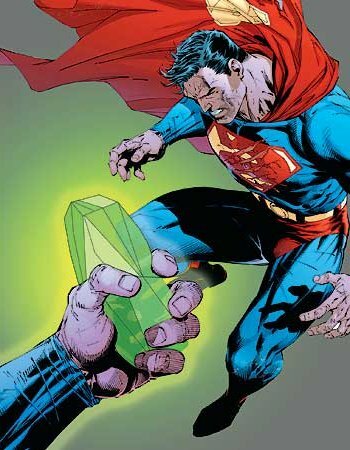 Compare, for example, the effect of Dürer’s solid on Winged Melancholia to the effect of the Kryptonite solid on the flying figure in the panel at the far right. Johannes Kepler, Harmonices Mundi libri V, Linz, 1619. Erwin Panofsky, The Life and Art of Albrecht Dürer, Princeton, 1955. Raymond Klibansky, Erwin Panofsky & Fritz Saxl. Saturn and Melancholy. Studies in the History of Natural Philosophy, Religion, and Art, London, 1964. Klaus-Peter Schuster, Melencolia I. Dürers Denkbild. Dissertation. Universität Göttingen 1975. Berlin 1991. Terence Lynch, The Geometric Body in Dürer’s Engraving Melencolia I, Journal of the Warburg and Courtauld Institutes, Vol. 45, (1982), pp. 226-232. JV Field. 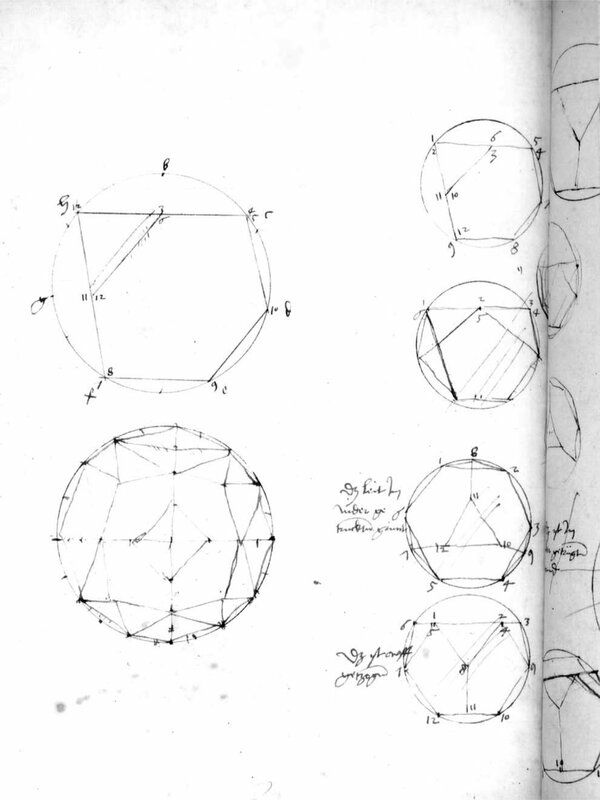 Rediscovering the Archimedean Polyhedra: Piero della Francesca, Luca Pacioli, Leonardo da Vinci, Albrecht Dürer, Daniele Barbaro, and Johannes Kepler. Archive for History of Exact Sciences, Vol. 50, No. 3/4 (September 1997), pp. 241-289. Peter Schreiber, A New Hypothesis on Dürer’s Enigmatic Polyhedron in His Copper Engraving “Melencolia I”, Historia Mathematica, Vol. 26, Issue 4, Nov 1999, pp. 369–377. Hans Weitzel, A further hypothesis on the polyhedron of A. Dürer’s engraving Melencolia I, Historia Mathematica, Vol. 31, Issue 1, Feb 2004, pp. 11–14. Hans Weitzel, Zum Polyeder auf A. Dürers Stich Melencolia I — ein Nürnberger Skizzenblatt mit Darstellungen archimedischer Körper, Sudhoffs Archiv, Bd. 91, H. 2 (2007), pp. 129-173.